This article features Khaadi eid collection 2017 lawn & chiffon dresses to celebrate this eid in vibrant summer colors. Khaadi latest eid catalogue consists of eid collection three piece lawn dresses 2017 and eid collection premium chiffon. Khaadi designers has brought together festive colors, ethnic embroideries infused in culture to make festive splendor this eid day. So indulge into festivity with luxurious Khaadi eid dresses 2017 because Khaadi has wide range of dresses from girls to women for every occasion from casual, semi formal to formal. 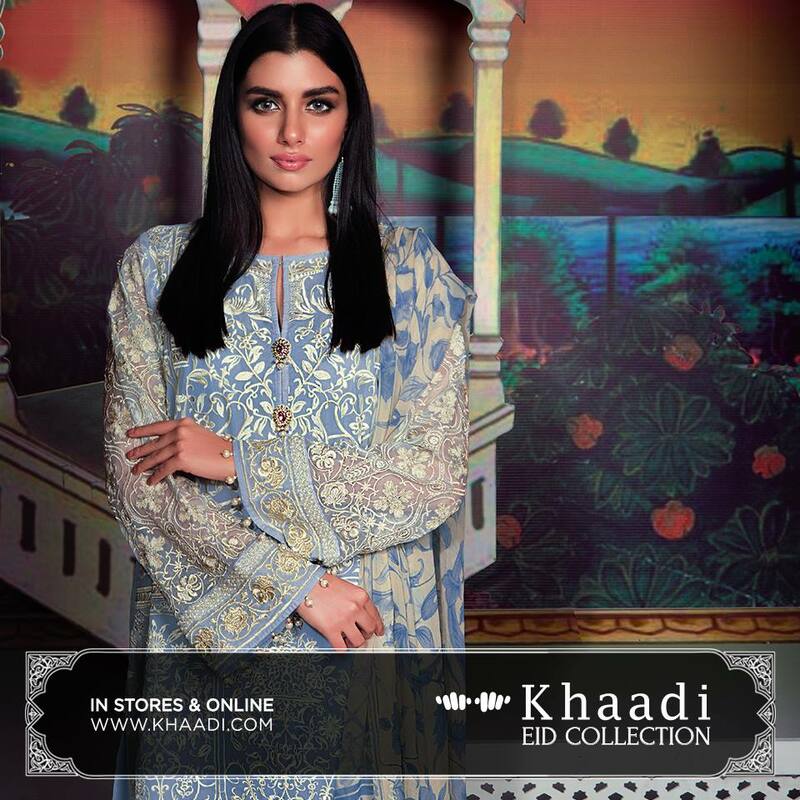 Take a trendy take on most anticipated Khaadi eid collection this festive occasion. Now wait is over go and grab your favorite dress for splendid eid celebrations. As brand it offers various dress options for women such as ready to wear kurta, unstitched lawn and chiffon dresses, ready to wear straight cotton and silk pants, Khaadi Khaas formal and semi formal stitched women dress for party wear. 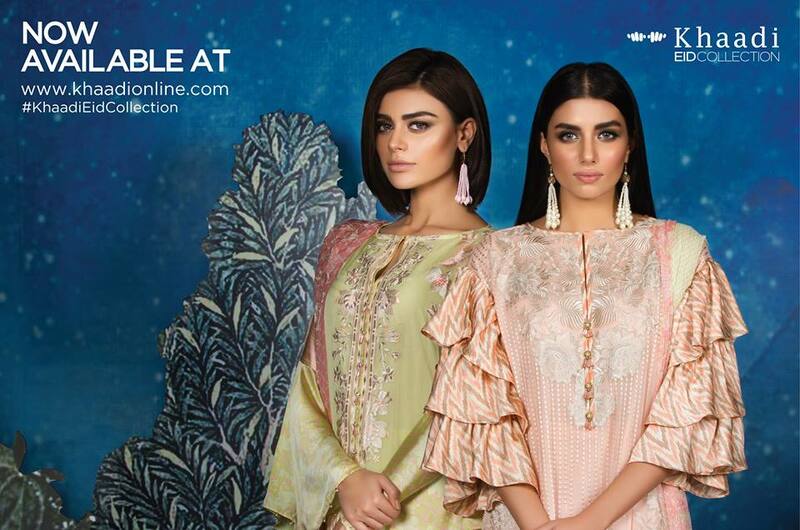 In this eid collection each suit consists of unstitched four piece, with embroidered front, back, sleeves and embroidered chiffon dupatta to create classic combination of traditional and cultural festive story for this eid. Below I have shared some of the most striking picks from Khaadi eid collection 2017 with nail, hairstyle, shoes and make up tips. This four piece eid wear apparel will look gorgeous for summer eid days, to get some extra kick paint your nails in summer colors with summer lip color and eid make up. See how to do summer nail art at home by clicking on the link. This dress costs 11,000 PKR. This green and pink embroidered chiffon attire is another pick for festive celebrations, this dress is worth 8000 PKR. Do a pink nail art design with essay eid make up, see one of my post to do eid make up step by step. This black lawn dress with embroidered chiffon dupatta is striking pick for eid celebration with comfort and style, this black dress price is 6,800 PKR. To add some extra style make trendy hairstyle, for making easy eid hairstyle see my post simple eid hairstyle step by step. This Khaadi beige chiffon suit with maroon embroidered dress is awesome for eid day to achieve sophisticated look. This beige and maroon chiffon embroidered dress worth 8000 PKR. To get more glam look wear high heels and simple strokes of light make up. Watch easy eid makeup video tutorial by clicking on the link. This light purple dress with all over floral embroidery pattern could be one of the best pick for eid if you prefer wear light colors to add more glam wear this with light make and bright lips. And price for this dress is 8,000 PKR. This is another decent dress from Khaadi eid collection 2017 for spending summer festivity in dapper looks and it costs 8,000 PKR. It would be smart choice for eid work and get togethers. This black chiffon dress with elegant white embroidery is lovely pick to make dapper statement at eid parties. There is a proverb when in doubt wear black so you can go for this chic black dress for eid evening. And the price for this black outfit is 11,000 PKR. This green chiffon embroidered suit is one of the gorgeous dress from Khaadi eid collection pair it with high heels and simple make and paint nails in summer colors to add glamour.